We want you to get the most out of your work with Barefoot Tiger. To prepare you for your first session with your teacher or trainer, we’ve compiled a list of a few things you might like to know. 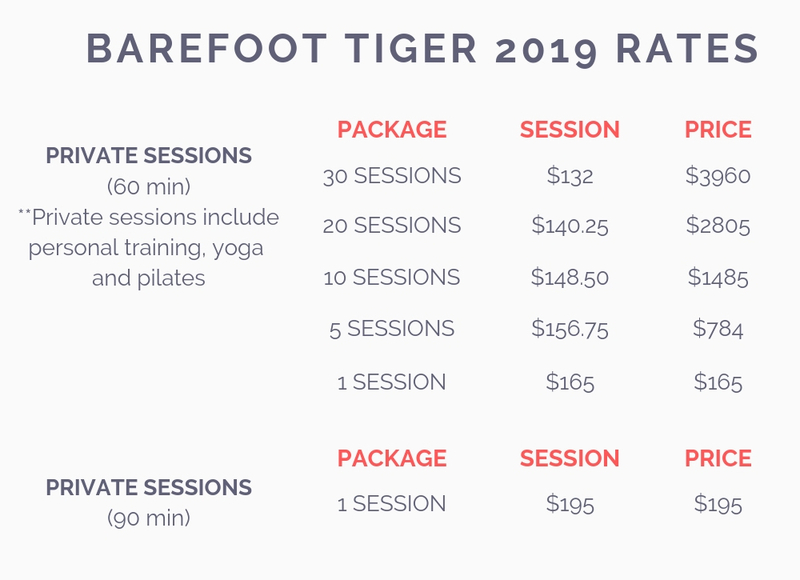 PLEASE NOTE: Barefoot Tiger has a 24-hour cancellation policy that is strictly enforced. Should you need to cancel a session, please contact your Teacher/Trainer or the Barefoot Tiger office at least 24 hours before your scheduled appointment. If 24 hours notice is not given, the session will be charged as a completed session. Exceptions that apply include: hospitalization, death and other reasons beyond your control. Personal training, Pilates, yoga and nutrition sessions are 60 minutes, unless stated otherwise. Your teacher or trainer will generally arrive a few minutes early to set up and your session begins as soon as your teacher or trainer arrives. Take time to relax before your session so you don’t feel rushed or stressed. Personal training: wear comfortable exercise clothing and sneakers. Yoga and Pilates: wear comfortable exercise clothing and bare feet. Try to avoid eating a full meal right before your session. If you are hungry, a small piece of fruit (apple, banana) about 30 – 40 minutes before your session will give you the energy you need for the hour. Payments must be received in advance of your scheduled sessions by Credit Card – Visa, MasterCard or American Express, or by check. Barefoot Tiger reserves the right to cancel appointments for which payment has not been received. All bulk sessions must be paid up-front in full to receive the discounted rate. Barefoot Tiger strives to provide the best possible service to our clients. If for any reason you are not satisfied with our services, we will issue you a refund for services not performed. Refund requests require a 48 hour written notice via email or fax (678) 960-1358. Barefoot Tiger reserves the right to amend this policy at its discretion. We make our best efforts to be on time to every appointment and expect the same from our clients. If you arrive late, this time will be deducted from the session; if your teacher or trainer arrives late, the amount of time will be added for an extended session. Barefoot Tiger has a 24-hour cancellation policy that is strictly enforced. Clients wishing to reschedule an appointment may attempt to contact the trainer directly to reschedule for the same day only. If no time slots are open or if you are unable to reach the trainer, the 24-hour policy goes into effect. If the Trainer cancels a session without 24 hours notice and cannot reschedule for the same week, he/she will make up the session to you with a complimentary session. All session packages and class cards expire one (1) year from the purchase date and all sessions must be used up by that time. All purchases are non-transferable. Barefoot Tiger requires all team members to maintain their professional certifications at all times. Personal Trainers hold certifications by reputed certifying agencies ACE, ACSM and NASM. Yoga Teachers have completed either 200-hour or 500-hour Yoga Alliance certified teacher training programs. Each of our teachers and trainers carry liability insurance and will supply ‘additional insured’ forms for buildings and studios upon request. We strive to make every session enjoyable and valuable, and will offer you undivided attention throughout your sessions. While we hold ourselves responsible for your training, we will hold you responsible for working to your fullest potential when we are together and on your off days in order to reach your goals. This path we are beginning is a collaborative effort and it will take everyone’s full concentration and effort to achieve your best possible results.